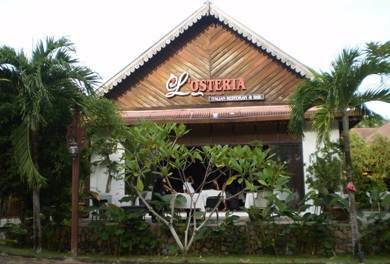 Nestled in a green setting and surrounded by garden and fish pond, this is an authentic Italian restaurant in Pantai Tengah. It also doubles up as a nice, friendly & laid back bar. The atmosphere is cozy & relaxed. You will see many tourists and even locals thronging this place who love genuine Italian food. 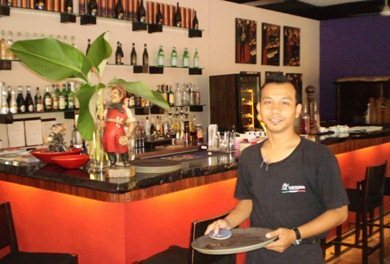 Lorenzo, the owner who has been running this restaurant since several years, is very passionate about how the food is prepared & served and the overall ambience. The dining place has a typical neo-traditional setting with village style roof carvings. Inside there are many modern arts hanging on the white walls. A light jazz or Italian music plays in the background. The restaurant while offers mainly indoor seating, also has a few tables placed outdoor in case you want to dine al fresco. Coming to food, there are quite a few Italian items in the menu. However my favorite is to start with the seafood soup. It's excellent and full of squids, mussels and other ingredients. The mushroom soup is also nice. They make wood fired pizza. The wood fired brick oven has been imported from Italy. The pizzas are thin crusted and really good. You can actually see the cook making your ordered pizza dough behind the glass partition and then putting it into an wood fired oven after topping it up with all the ingredients. One of the best pizzas that we love here is the Pizza 4 Stagioni. It has assortments of turkey, ham, Mozzarella cheese, tomato, mushrooms, olives, artichokes etc placed on a thin crusted Pizza base. Tastes delicious. Another great dish is the soft potato gnocchi basil pesto alla Genovese and asparagus. Compliment that with zucchini and potatoes. If you like, try out the superb duck confit agnolotti topped with thick mushroom sauce and hint of mint. The duck filling is really tender. For pasta, one of their signature dishes is the seafood pasta. Another great one is the pasta with oysters. The seabass fillets are also nice. Other great dishes include the homemade Ravioli. They also prepare nice steaks and lambs. But tell them specifically how you want them to be prepared. Finally complement your meal with some great desserts like mango crepe with mango ice cream, tiramisu, one from many choices of gelati etc. The service is nice and friendly. If it gets crowded then service gets affected at times and the wait time increases after you order your food. But as I said, it is a laid back restaurant and you should not go there expecting a service of a top notch upscale restaurant. They serve lunch & dinner. Bar is well stocked and has good selections of wine. Daily 12noon to 12 mid-night. They accept credit cards.